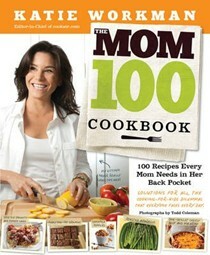 Published in 2012, The Mom 100 Cookbook was Katie’s first book. 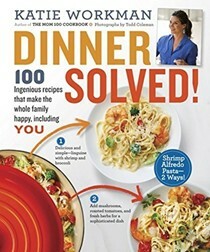 It was nominated for an IACP award and selected by Cooking Light as one of the best 100 books of the past 25 years. This summer (August 2015), she follows up with Dinner Solved! Katie also writes The Mom 100 Blog, which won the BlogHer Voices of the Year award in 2013. 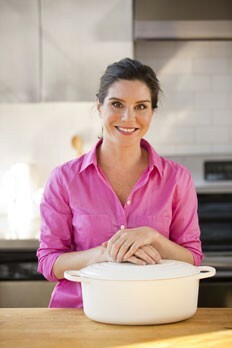 Katie is the Cooking for Kids Expert on About.com. Additionally, she is a regular guest on NPR’s All Things Considered and does a bi-weekly interview on Daybreak USA, a national radio show. In 2008 she co-founded Cookstr.com, where she acted as editor-in-chief and established the popular Cookstr weekly newsletter. Her other food writing includes articles for The Wall Street Journal, iVillage, The Daily Beast, AARP.com, The Boston Globe, and New York magazine. Katie has also done television and radio satellite tours, taught cooking classes and performed cooking demos, participated in and hosted various food panels at conferences, and been has featured in various national and local media, including the Today show, VH1 Big Morning Buzz Live, The Talk, The New York Times, Food & Wine magazine, and Parents magazine. She works selectively with brands as a spokesperson, and the in development of content and recipes. Katie sits on the board of City Harvest, New York’s leading food rescue nonprofit, and for the past 20 years has been an active supporter of No Kid Hungry/Share Our Strength, an organization dedicated to eradicating childhood hunger. She lives with her pretty great husband and two hungry boys, and a delightful puppy in New York City. Their dining table can fit ten people, which often comes in handy.